This example explains how to use Check All Checkbox In GridView To Bulk Edit Or Update in ASP.NET with C# and VB.NET. I have put a checkBox in header Template of gridview which on checking will check all rows in gridview using server side code to implement CheckAll CheckBox functionality. SelectCommand="SELECT [ID], [Name], [Location] FROM [Details]"
DeleteCommand="DELETE FROM Details WHERE (ID = @ID)"
that was really grat .. awsome.. jst awsom..
infact .. m newbie ,, nn i cd't eva expect tat as i ld run this code,, it ld run widout any exception ..
Nnn Mr Amit ,, u did it .. In this article the code for delete and update is done with asp.net. but can u please provide me the c# code for update and delete button. Unquestionably, I love it, useful and well-founded thoughts. Make sure you come up with more fascinating content in your. Absolutely, I love it, important and well-founded thoughts. Remember to create more appealing content articles in your. 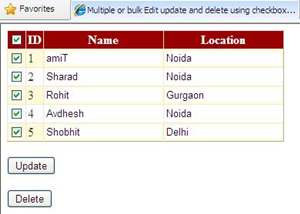 I need your favour please do let me know that is how to update selected rows in database using Gridview checkbox. and also i want to get seleted checkbox should be checked when i get refresh the page. i shall be ever remain your grateful if u help out. can u please sed me c# code for the same example but the problem is that i have grid view and retrieve data from database can u do it ? plz help i want it badly.